Insurance for many may be a word that carries a variety of emotions. Residents of Michigan complain about the unfair pricing for automobile insurance. Some are even paying premiums that exceed their monthly car payment. And many are still impacted by the invisible red line which results in some areas paying higher premiums than others based on location. When it pertains to health insurance, many people are faced with having to understand their individual health insurance benefits and plans. Patients are responsible for meeting deductibles, which result in patient responsibility and payments that are due at the time of service prior to being serviced by a health care professional. Some patients are finding out they do not have the coverage they thought they had and they are discovering this usually when it is too late. Mr. Alvin Lynn was one that had to take an interest in learning about health insurance, specifically Medicare and understanding its plan. Mr. Lynn moved back to Michigan to be a caregiver (along with his siblings) for his mother who was diagnosed with Stage 4 Cancer. As a result, he became interested in understanding his mother’s options as it pertained to her insurance coverage. He began investigating her plan in an effort to understand of her medical options that were available within her Medicare plan. 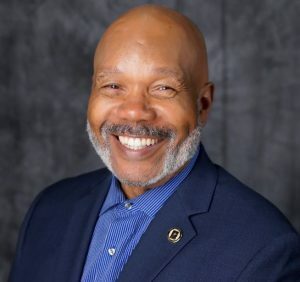 Realizing that so many seniors were unaware of their insurance options and having a desire to help others, ultimately lead Mr. Lynn to launch OPTION Insurance Group. OPTION Insurance Group began specifically focusing on Medicare and selling Medicare plans. 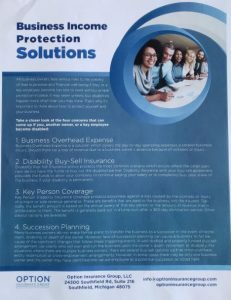 Now OPTION offers an array of services, some of which are Business Income Protection Solutions, Disability Insurance, Annuities and Long-Term Care Insurance. The Mission of OPTION is to provide the right insurance, keep the process simple, and educate the client. Their team is responsible and accountable to educate and provide the right insurance and income protection tools that are most important to the person, retiree, professional, entrepreneur, business owner, and others. They eliminate confusion and make it an easy process. Mr. Lynn is dedicated to ensuring that every individual has coverage that meets their unique desires. This is accomplished by taking the time to have personal conversations and actively listening to what individuals are saying. By provided services that meet the individual’s needs, Mr. Lynn is able to eliminate some of the misconceptions people have when it pertains to insurance. When Mr. Lynn mentioned misconceptions, I’ll admit I had a few of my own, the first being cost. But surprisingly Mr. Lynn educated me by letting me know that cost was a huge misconception and that insurance can actually build wealth. Additionally he informed me that insurance is the best way to protect your assets. Our businesses can thrive when our assets are protected. According to Mr. Lynn, it is imperative that our businesses thrive because of one word…Legacy. Community grows through legacy. Be on the look out for our discussion with Mr. Alvin Lynn and find out more about him and his passion and purpose for this business. Please share this article and the information provided, because you don’t have an option when it comes to insurance. Insurance will begin the path to legacy, creating stronger communities, and Mr. Lynn is providing the OPTION.